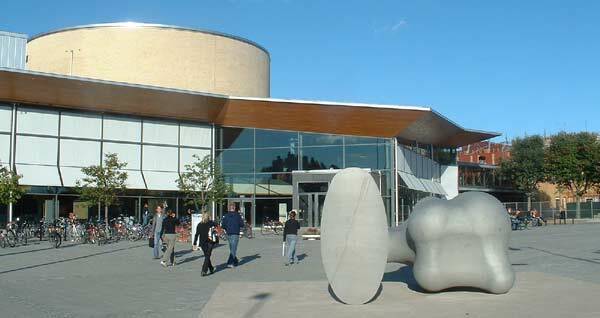 held in Marstrand in October 2002. Some of the participants at the SASNET seminar at Karlstad University: Malin Holmgren, former student at the Dept. of Religion; Staffan Lindberg, SASNET; Helen Blomkvist, Dept. of Political Science; Per-Olof Fjällsby, Dept of History; Inga-Lill Fjällsby, Teachers training department; Marc Katz, Dept of Religion; and Peema Dorje, College for Higher Tibetan Studies, Dharamsala, India. The purpose of holding a South Asia day was to inform about the research. education and exchange programmes that are carried out at Karlstad university in connection with South Asia; and to discuss how SASNET and Karlstad University should be able to develop a closer collaboration. Per-Olof Fjällsby, Dept of History, made an introduction, before leaving the floor to Staffan Lindberg, who emphasized SASNET’s willingness to promote KU’s South Asia oriented activities and the opportunities that SASNET can offer. Inga-Lill Fjällsby, from the Office for Educational and Research Planning, then presented the history of KU in India during the last 20 years, focussing on the major role that Ganga Mahal, the Swedish Study Centre in Varanasi, has played. See SASNET’s page on Karlstad University activities in and with South Asia! Compare also with details described in the report from the SASNET meeting at Karlstad University in December 2000! After the presentation Staffan Lindberg enquired about the possibilities for other Swedish universities than those already involved to use the facilities of the study centre at Varanasi, and got an affirmative response from Inga-Lill Fjällsby. P-O Fjällsby however added that there is a problem in that the university does not pay anybody to administer the South Asia activities. It is therefore based on voluntary work by a few individuals. Furthermore there is an economic uncertainty in that the Swedish Study Centre at Varanasi is financed by the students fees only. 10.00-11.15 Experiences from Working with Film as an Academic Tool. Associate Professor Marc Katz, Dept of Religion, came to the seminar along with a number of students. Katz has specialized on working with documentary films as a tool for research on Indian religion. More information on Marc Katz film projects since 1994. He is presently working with his third film, focussing on Muharram, the Shia Moslem festival which in Varanasi is a multicultural event being celebrated by members of all communities. The film, parts of which now were shown, is based on fieldwork carried out in 2002 and reflects, according to Katz, the all-inclusive traditions that are so strong in Varanasi. Katz complained that working with documentary film is not an established research method in Sweden. Unlike in some other countries it does not give any academic merits in Sweden, and no film archives are available. He argued for the many benefits that documentary films have, especially the possibility to analyze and reinterpret the material several times as you are able to view things from different angles. Often interesting informations can be discovered at a later stage among material you have first overlooked. Marc Katz mentioned his film ”Holi Hey” which he made 10 years ago, and where he has made such discoveries much later. A discussion on the topic followed, in which Staffan Lindberg, SASNET, suggested that a seminar should be arranged on ”Film as a research method”, and he also urged Marc Katz to formulate his theoretical framework in writing. This idea was also supported by P-O Fjällsby. Associate Professor Kjell Härenstam, also from the Dept of Religion, has been involved in text book studies since the early 1990’s. He studied the images of Islam given in Swedish text books, and published a book ”Perspektiv på Islam-bilden”, and he took also part in an International German-led project on the same issue. Later on he travelled to India, visited the Buddhist pilgrimage place Sarnath, and by chance he also visited Dharamsala with a group of Karlstad University teachers training students. He then changed his research focus to study Tibetan Buddhism, and how this religion has been portayed in Swedish text books. An interesting observation he made was that the image has reflected the political development. In the 1970’s the image was characterized by Chinese propaganda and was very negative – the image of a degenerated variety of Buddhism, but after the Tiananmen massacre, and the Nobel Peace Prize awarded to Dalai lama, Tibetan Buddhism is now positively described in Swedish text books, as an ancient philosophy well adapted to modern times. Kjell Härenstam then informed about his new research project, dealing with mutual stereotypes in school text books in India (the states of Himachal Pradesh and Uttar Pradesh), and in Sweden. He has decided to specially study how the concepts of ”Nationalism” and ”Equality” are dealt with, and also how these concepts have undergone changes over time within the two countries. Furthermore he is going to examine the ongoing higly controversial revision of Indian text books, initiated by the BJP dominated government. Elisabet Härenstam, Dept of History of Literature, visited Dharamsala for the first time in 1995, and she became fascinated by the Tibetan refugee community, and its strong ambitions to keep the traditional culture in exile. As Elisabet is also an avid storyteller she started to search for some good Tibetan storytellers. She was recommended by Dalai lama to meet Peema Dorje, headmaster at Tibetan Children’s Village, and that meeting turned out to be very fruitful. It resulted in a book called ”Det var en gång en sjö” jointly published by Karlstad University and a Tibetan publisher in India. The book, consisting of Peema Dorje’s childhood memories, was beautifully illustrated by a Tibetan thanka painter, and had an introduction by Dalai lama. 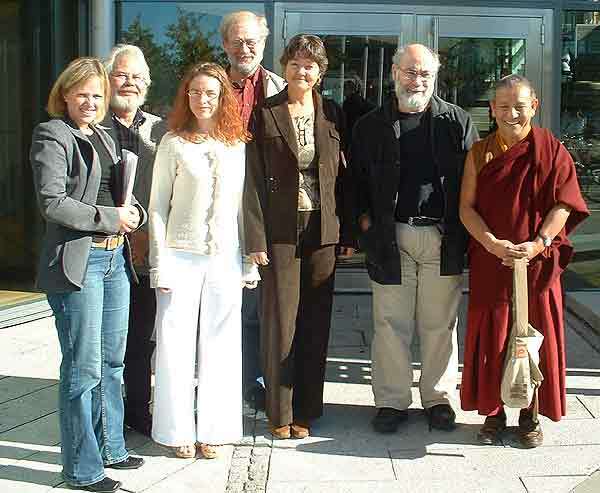 The two have since continued to work together, and Peema Dorje, now in charge of the teachers training at the College for Higher Tibetan Studies at Dharamsala – established in 1996 and an institute with which Karlstad University has a collaboration agreement – has visited Karlstad every year since 1998. In the same way as with the first book they have now produced another one, called ”En enda rödklädd unge”, which they were going to present at the 19th Göteborg International Book Fair 25–28 September 2003. Elisabet Härenstam presented their books project and a slide show produced by media students at a Karlstad high school. Peema Dorje then presented himself. With a monastic educational background he is now much engaged in modern Ecology and Psychology – ”which have much to learn from Buddhism” – and is responsible for the upkeep of 84 Tibetan schools in India, 15 in Nepal, and 5 in Bhutan. 13.00- 13.30 What can a network like SASNET offer? Lars Eklund, SASNET, made an extensive presentation of the SASNET web site, and the possibilities it offers for researchers, teachers and students at Karlstad University. Professor Gerhard Gustafsson, and three former C-level students (Kristofer Andersson, Sara Westlindh and Andreas Hofer), from the Dept of Geography and Tourism presented their department‘s long-standing India connection. Contacts were established through Prof Rana P B Singh, Dept of Geography, Banaras Hindu University (BHU), Varanasi, India, who visited Karlstad first time in 1989. Geography students from Karlstad have from the beginning of the 1990’s regularly gone to Varanasi to do fieldwork, and one student has even carried on and eventuelly completed her doctoral dissertation on the study of a village outside Varanasi. More information on Kristina (Nina) Lejonhud’s dissertation in June 2003. Karlstad University has been able to secure funds from the Linnaeus Palme Programme for teachers and students exchange with BHU, and the department has in the last few years held seminar series in Varanasi for its students, along with other Karlstad students from the Dept of Religion. Gerhard Gustafsson described the problems that students face while carrying out field work in India, and the main problem is the language barrier. For studies on tourism (which have been popular) and studies carried out in the cities it may do with English, but to do village studies with no command of the local language is very problematic. Besides certain issues, like women’s studies or politics, might be sensitive in an Indian context. In spite of such hurdles Gustafsson was pleased to tell about the field work studies being produced, especially those comparing different cultures and eventually finding similarities between the development in India and Sweden. The three former students then told about their personal experience from doing fieldwork in Varanasi last year as part of a group staying at Ganga Mahal. They complained that they had no Swedish supervisor with them, and that was a negative factor negatively affecting the scientific level on the field reports. Regarding their accommodation at the Swedish Study Centre it also turned out to be a mixed blessing to live together with only other Swedes. However wonderful to have access to a library, a well-connected local supervisor, Omji, and interpreter service, on the other hand it created a form of isolation from the surrounding Indian society. It might end up that all the Swedes just sit in their cosy study centre, seeing only each other or acquainting backpacker tourists. When the group is rather big it easily happens that contact making with local people does not become a priority. A couple of the Swedish geography students could not be accommodated at Ganga Mahal but had to stay at an International guest house called Amar Bhawan. They reported much more useful International contacts established there, e g with American PhD students from the University of Wisconsin, Madison, who had a thorough knowledge on India. Staffan Lindberg, SASNET, intervened by describing the somewhat different method followed by Österlen folk high school in Tomelilla, who sends students on its undergraduate social science course on India/South Asia (see information). Their students after an initial joint week in South India then divide in smaller groups and do field work in many different places. • They should also have visited villages and not just stayed inside the city. • Too much research and studies have been focussed on Varanasi, and in particular the Assi Ghat area near to the Swedish Study Centre. • The field work reports should be written in English. Now they are mostly written only in Swedish which makes their impact negligible. Besides it does not create any response back to the local people interviewed/reported upon. As the programme for the day had run over time considerably the final discussion on how to continue cooperation for South Asian studies did not materialize as a separate point. All participants were however happy with the outcome of the day, and SASNET offered its assistance in improving the aspect of information regarding South Asia related activities at Karlstad University in the future.